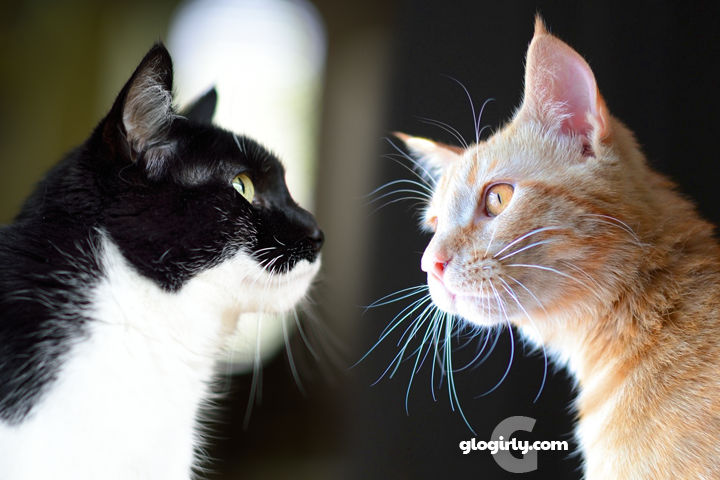 GLOGIRLY: How Can Two Cats with SO Much in Common be SO Different? How Can Two Cats with SO Much in Common be SO Different? KATIE: Nature vs. nurture has always fascinated us. Just like Waffles and me, Glogirly was adopted when she was a baby. So to say she's spent a little bit of time pondering how we are who we are is an understatement. She's quick to admit that her adoptive parents had more influence on who she is as an adult than anyone else in her life. She's always believed that nurture, more often than not, supersedes nature. KATIE: Yes, Waffles. And them came you. Adopted from a shelter as kittens. Grew up and live in the Townhouse with Glogiry & Gloman. Cared for by the same cat sitter when the GloFamily is away. Cared for by the same vet. Ate (mostly) the same food. K: Quiet and reserved with sweet little meow-chirps. W: Loud and in-your-face with epic meow-songs. K: Slow, careful, dainty eater. W: Fast, messy food thief. W: Cautious at first, then flirt flirt flirt. K: Sleeps on it during the day. W: Sleeps on it at night. K: Ground dweller. Loves to burrow. W: Tree dweller. Would walk on the ceiling if he could. K: Loves to carry toys in her mouth and bat them across the hardwood floors. W: Loves wand toys, lasers and jumping. K: Sits next to Glogirly while she's writing blog posts at night. W: Sits next to Glogirly while she's writing blog posts during the day. KATIE: Some say a cat's coat color is linked to personality. Friend and fellow cat writer Ingrid King of The Conscious Cat wrote a fascinating article about this for Answers.com. Gingers are often thought to be affectionate but can also have a little bit of a temper. (Does crazy count as temper???) 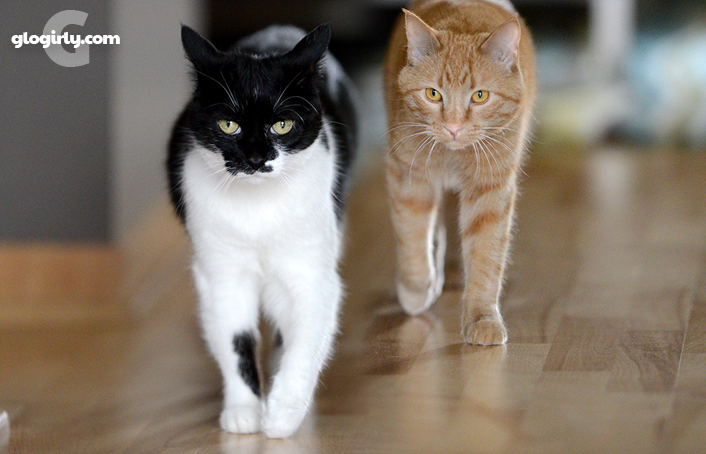 Black and white cats can be more even-tempered and placid. 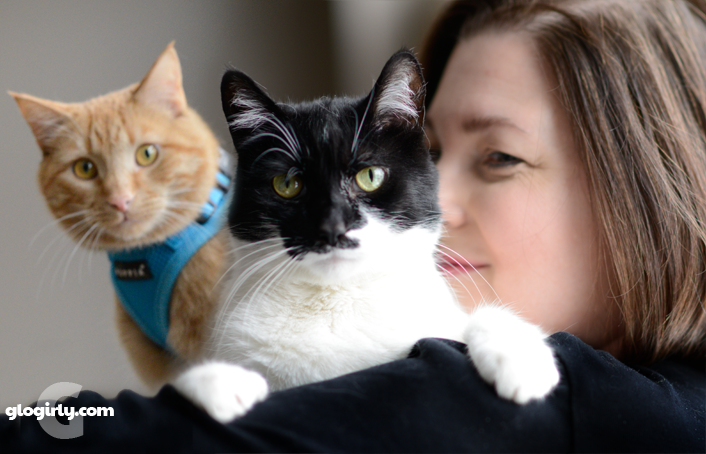 On the flip side, we know of another orange/black & white duo, Hemingway and Shakespeare from Two Cats' Views, who are our polar opposites. Hemingway is the tuxedo and has a personality just like Waffles. Shakespeare, the orange boy, is much more like me - reserved and well mannered. Proof that no matter what, we are ALL mysterious. KATIE: We may have different personalities, different voices and different routines, but one thing we DO have in common is the love of our girl and her guy. Both of us have very special, albeit different, relationships with Glogirly and Gloman. And we wouldn't trade those for all the catnip and chicken in the world. WAFFLES: Did you say ALL the chicken??? What do YOU think about nature vs. nurture? How about coat color? Do you have a theory, or are we a complete mystery? Well, from MY experience, Whitesters are smart and NORTY! They put Ornj cats to shame with their capacity for badness...Waffles has something to strive for. Or maybe not. Have pity on placid Katie! Our two tuxies are much like her in temperament. Our black and white boy, Maurice, was calmer than us orangies, but he wuz super affectionate too (he actually gave hugs). Me and Crockett are both crazy and Angelique are more reserved, but still sweet. From my experience there's a definite gender difference in personality. Our girls are more like Katie, and our boys are more like Waffles. We also have three siblings, who have both similarities and differences - it's fascinating. PS. Amber sends hugs and a virtual chicken leg to Waffles! I really don't know, although my human also thinks nurture plays a very big part in the way kitties are. At the same time, my parents are known for having especially nice, good-natured kittens. So it must be a mixture. I have to agree with Glogirly: love is what really matters. I've met, known, lived with, and/or been owned by many cats, each with their own purrsonality and cattitude, and all have been fabulous felines. A friend I lived with for two years, she fosters for a rescue and she had a pair of sisters, Salem and Samhain (pronounded sow-in), she'd taken in at two weeks old when I moved in with her and her husband. They were a few months old when I arrived and it was very hard to tell them apart based on appearance, but it was easy to know one sister from another by purrsonality. When it came time for the girls to go up for adoption, my friend and her husband decided to adopt them. Go foster "failures"! ;D Salem was more reserved and dignified (as much as an energetic kitten who's zooming around all the time can be), and as she grew, she was longer, thinner, and sleeker than her sister. When I moved out, Salem was the cat you knew was judging you, your things, and what you did, and you knew she disapproved of everything on general principle. She was aloof as a young adult. I adored her, because she'd act like such a priss, but she was such a total sweetheart once she decided you were worthy of her attention and she liked you. Samhain, on the other hand, was soft, roly-poly, not very graceful, and a clown. Outgoing, into everything, curious, a goof, chirping at you to get your attention. She was everyone's friend and you couldn't not adore her. Salem and Samhain were (and still are, I'd assume) BFFs. and I have four and they are all very different ! We don't know ..... Crazy may be inherited! I have two ginger cats. One male and one female. Plus a Tortie and a tuxedo! My male wants attention after he eats. He actually wants us to watch him eat! My female prefers to come only when she wants needs skritches. My tortie at 6 pounds is the alpha cat and would fight her much bigger brother and sisters for prime spots next to me. But my tuxedo can be a clown, a lap hog and a lover. And since her sister the tortie has been sick with COPD, she has been my almost constant companion and has taken over the alpha cat job. But she is still my sweetest! I think we are all born with our own soul/personality. Any mother with more than 1 child, human or furred, can tell you that each one of her children has been a complete person from the first day. Maybe no one else would have noticed, but the one, caring for the baby gets to know its personality from that first connection. Everyone is born special and deserves to be loved and cared for. And we each have our own road to travel in finding our family, however it is made. I think maybe we get to know some of the secrets of the how's and whys when we level up. Of course love is what matters. The head peep would agree that orange cats are a bit... naughty. Newton takes the cake (sometimes literally) in that department. The head peep wonders whether how much of our personalities have to do with the phase of her life she was in when she got us. More computer time/less TV time for the humans seems to yield cats who aren't as cuddly and lap-seeking, or that's how it has worked around here. This seems to be the age-old question about us cats. And the mom can't figure us out. But we agree, love is the only thing that matters. It is interesting. Especially here to watch kittens from the same litters grow from tiny to adoptable and how different they can be. We are as different as night and day too! Oh, and Summer, we read what you said about crazy torties MOL!!! I've found that orange cats are very loving and loyal, but they also tend to be a bit mischievous. Lynx-point Siamese like Lita are kind of rare, but all the ones I've met (including Lita) have been incredibly affectionate, loving, and social. I enjoyed reading Ingrid's article last week. This is a very interesting discussion. I've volunteered at PAWS for 13 years and have met many cats. There have been a lot of sibling adults and there. You would think nature and nurture being the same, they'd have similar personalities. But usually there's a shy one and an outgoing one; a fearful and a laid back cat. PS. I agree with Summer regarding torties! I've had every color of cat - no purebreed - and each one is unique. I've treated them all the same with lots of love and treats. Some are affectionate some are here for the free food. Every time a new one shows up I just toss it into the mix and let it figure its way with the others and it has worked. My current four get along until Sherpa gets a wild hair and decides to chase somecat all over the place. Then it's everycat for itself. Well, the black and white kitty in this house is the one with the temper. The gray one is mellow and loves to be petted, but can be a bit if a bully. The orange one loves to be petted around the head and shoulders, but leave the rest of the body alone! All enjoy the lap, all love wand toys. All came from different places. We are gonna go with nurture as well! The woman says cats will be cats no matter their color! Yes, we are the complete opposite of our neighbors Katie and Waffles. When Mom reads to us about the two of you, we have to chuckle 'cuz it seems like you're talking about us but we're in the wrong colors! It gets confusing. MOL We're glad that we're all unique. Each one of us fur people have special qualities that set us apart from everyone else. Those special qualities fit perfectly in the hearts of our humans. Good post Katie and Waffles! Oh, we better add Glogirly to that compliment 'cuz she operates the keyboard! I think every kitty is unique and I love them all. I have read of tortie personalities though and I can see that with our Penny too. There are so many factors that will determine personality right down to the DNA inside our genes. Every single one is unique and different just like snowflakes no two are the same. But both are beautiful and Katie and Waffles are so loved. just like people, cats, dogs, all animals....we're all different. Siblings raised in the same home with the same parents are different. That's what makes us each special. That's also a reason that breed discrimination in dog and myths against black cats need to cease. You, everyoneos different. Even human twins are different! We just know that you two kitties are the luckiest kitties in the world to have beenu adopted by Golgirly and gloman. You have a great home and are dear.u loved. Life is good! We have 4 kitties, the oldest one is gray and the other 3 are black and every one of them has their own personality. I have a shy, not so bright black cat with out a mean bone in his body, another one is my mischievous kitty, he is also jealous and needy, but we can't imagine life with out him. My third chocolate is my little girl, she is shy of visitors and is quite lazy but she knows how to let the boys know if she does not like something. My oldest in the gray kitty and he rules the house and he is the smallest cat in the house. All occupants of the house had best listen to him including the humans! Love them ALL! There's one big difference that I dont know if anyone has pointed out. Katie was an only cat for a long time. Waffles had a big sister from the start. There's a huge difference between older and younger siblings, even adopted ones, based on birth order. For instance, Katie could afford to eat slowly, no competition. Waffles has two dishes to check out, even if one is not supposed to be his. Katie had all the attention she wanted or didnt want, Waffles has to carve out his own time and probably had some jealousy. Anyway, that's just a thought. Yeah, same house, same pawrents, but still different lives. Eric and Flynn were litter mates and were opposites. Flynn races around like there is no tomorrow. Eric took his time with everything. Eric was a lap cat and would sit there for hours if you let him. Flynn will stop for 5 minutes if you are lucky. Opposites in many more things but both loved equally. Well mommy sez it's a lot 'bouot those first foo weeks of life. Mommy has had sevewal kitties fwu da years wiff diffewin' purrsonalities. Sum more bweed specific than udders. And then her wescued Lexi and Lucky and then finally me. She had to bottle feed all 3 of us. Lucky wuz a Siamese, and Lexi be an Egyptian Mau, but they had many of da same purrsunality twaits. Mommy sez it's cuz she waised them togedder and bottle fed boff. And then when me joined da furmily and mommy had too again bottle feed me, she sed dat me be a yung Lexi. So mommy wuld awgue fur those first foo weeks iin a kitties life bein' wesponsible fur how a kitty sees da world, innewacts wiff it and you, and how they wespond to da workd and it's challenges. Dreby and I were gingers, both adopted at a year and half old. I am shy with strangers, he was Mr Sociable. I like to cuddle with mum, he didn't. I like to eat slow and enjoy my food, Derby would gobble it down. Oh well, mum loves or loved us both. 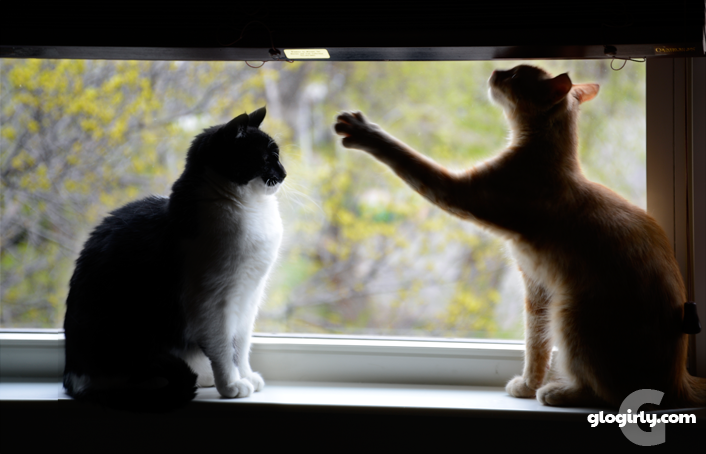 Everyone of my cats have had a different temperament. Sasha is a tabby, generally relaxed and laid back but oh my that boy can holler, he doesn't care for strangers at all. Silver, also a tabby, was very shy, didn't really like anyone other than Sasha, (we were tolerated because we fed her), she hardly talked at all. Sami, another tabby (with some tortie colors) is the Walmart greeter of the group, loves everyone and I mean everyone, she just chirps and is simply loveable Silas and Shady were litter mates, he was an orange tabby, she was mostly black, both were laid back and relaxed and simply gentle souls. Saku is the black and white tuxie, the wild child, very vocal and demands attention when he wants it. I don't think the color matter, they simply have different personalities and even though all were adopted by 6 weeks the interactions they had with one another also seems to have had an impact. Waffles and Katie, you're absolutely correct...all that really matters is that you are loved and love your Glogirly and Gloman That makes everything perfect! Katie, I regret to say I share more in common with Waff with some big exceptions and you know what they are. Well, other than being kind of a show-off for guests, I am quiet and reserved and sweet, like you, Katie. Except when I need something. Food, water, cleaned litter box, scritchies, scritchies... Did I say scritchies? Almost as important as the other stuff. Then I raise my voice. A lot. Really enjoyed your post and learning more about their personalities. Tubby my ginger is active like Waffles but; doesn't steal food. Cashew my cream colored one does and is loud but; loves hugs. Garfield is the grumpy but; loving ginger. Charlie my B&W is more like Katie. Now Hope the youngest is all of the above in one cat. LOL. She watches her brothers closely.